You can find the second part of this series here: Vectors and Kinematics (Part 2 of 2). Displacement is the change in position of an object. This is not the total distance an object has travelled. 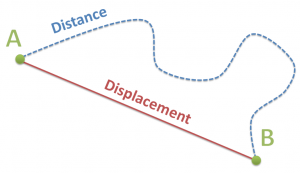 The total distance travelled can be greater than the magnitude of its displacement. Velocity is a vector quantity. It is speed, and direction. Instantaneous velocity is the speed and direction at a certain point in time. Acceleration is the change in velocity over time. It is also a vector quantity. Linear motion = change in distance / change in time. How long will the ball move up? How high will the ball travel?